Behavioral healthcare furniture needs to support your eﬀorts to help your consumers heal, while keeping everyone safe. Understanding the speciﬁc needs of the patient population, staﬀ and visitors is crucial to behavioral healthcare facility design due to unique needs like managing self-harm risk, preventing assemblies that can be used as weapons, eliminating sharp edges, minimizing contraband, and optimizing independence. 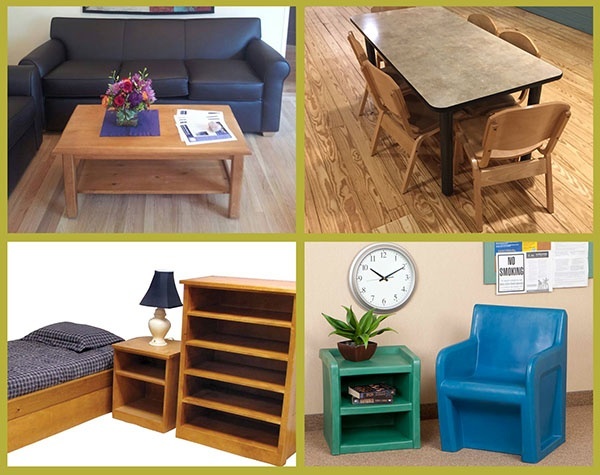 A wide array of furniture solutions allow patients and staﬀ to feel safe and comfortable during therapeutic stays including: One piece molded plastic furniture that has no removable parts. Ligature free furniture designed to minimize self-harm risk. Easy to clean fabrics and ﬁnishes for maximum safety and comfort. Bolt down/weighted options for behavioral outburst. When trying to combine style, functionality and cost, what are your real options? Choose seating, beds, tables and other furniture solutions designed for heavy-use. Bland, sterile-looking healthcare facilities are a thing of the past. Aesthetics now encompass a broad range of healing elements including energetic color-schemes and nature-based hues that encourage comfort. But beyond the basics of color is a new world of functionality. Furniture and ﬁxtures for health care and healing environments must also prevent falls, encourage mobility, discreetly deal with incontinence and ﬂuids, maintain sterile surfaces and support the latest patient-centered technologies. Fabrics and ﬁnishes designed for heavy use are made to exacting standards to ensure stability under constant use, resist staining, deter breakage, prevent ﬂuid seepage, defend against bacteria and microbe growth, and so much more! The Right Furniture plays a vital role for Behavioral Health facilities. The right furniture and the right fabric can help your facility look like a place where people can heal. Products are also designed for durability to create a lasting investment. Contact Furniture Concepts today to talk to a furniture expert about investing in the right furniture for your patients.